Along with its strategic position between the Valle del Corno and the Valle del Tissino, a number of important archaeological digs have confirmed that Roccaporena has been inhabited for thousands of years. Today the village is known primarily as a place of pilgrimage, attracting hosts of faithful who come here to venerate the so-called “Scoglio di Santa Rita”, a large oblong-shaped rock believed to have the marks of St Rita’s knees and elbows. 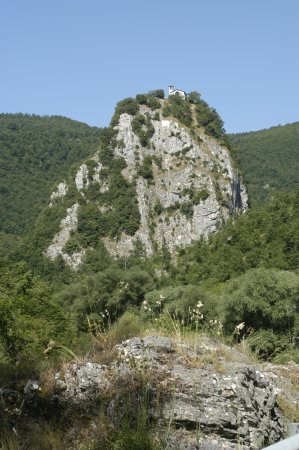 The lower section of the mountain on which Roccaporena stands slopes far more gently than the upper part, with a northwards-running river that passes rocky crags sprouting up through fields and farmland stretching down to the water’s edge. In some places the water runs through canyon-like gorges, offering a dramatic contrast to this Arcadian landscape. 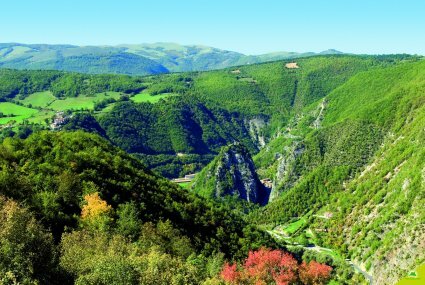 It is immediately after one of these narrow gorges that the river runs along the Sacred Rock of Roccaporena and then flows eastwards past the steep slopes of Monte della Sassa (mt 1131) towards Cascia. This area, along with a number of other places in the central and southern Italian Apennines, as well as in parts of Sicily and Sardinia, is the last remaining home to a small bush that has survived since the Tertiary Age: the Ephedra Nebrodensis. mountains are the ideal nesting place for an abundant variety of bird life such as the common kestrel, the mountain swallow, sparrows, Black Redstarts, magpies and even a pair of Lanner falcons – a very rare bird of prey that is present in only ten sites in the whole of Umbria.